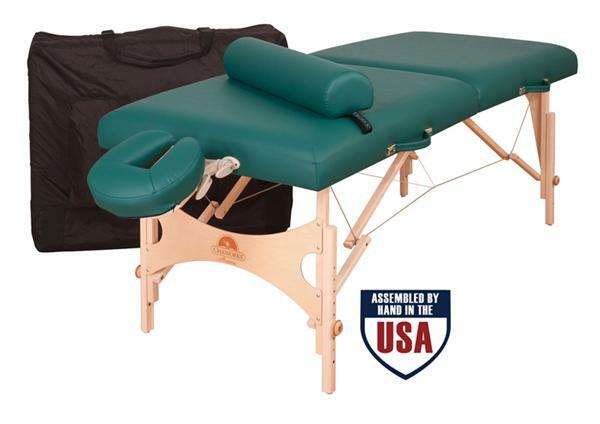 The Aurora massage table with Essential Accessory Package comes with the Oakworks® Essential Carry Case, Quicklock Face Rest Platform with Aero-Cel Face Rest Crescent, 6" Semi-round Bolster. Buying your first massage table is like buying your first car. The decision you make can determine how far you go in you your career and how fast you get there. The combination of luxury, durability and value makes the Oakworks Aurora portable massage table the perfect way to jumpstart your career. Recent massage school graduates know that starting out with a portable massage table is a great strategy for growing a massage practice, allowing access to the greatest number of potential clients. When your clients aren't mobile, your massage practice has to be, because you can't always rely on new clients to come to you. The American made Oakworks Aurora gives you the freedom to build your client base whenever and wherever you want to. ® exclusive design integrates the attachment of the bracing system to offer incredible strength and lighter weight that no piano hinge can match. Super quick, easy to use closure system folds that out of the way for shiatsu and won’t rip your sheets or mark your floor. Our unique system allows you to get your legs under the table at the height you work, offering the best access on the market. The shiatsu cables allow the table to lie flat on the floor. 5. CABLE LOCK SYSTEM Our system uses stronger cables than anyone else, designed not to stretch or fail even under the heaviest loads. choose from over 20 colors!